You plan your wedding to the last detail: who to invite, who’s in the wedding party, what your in-laws should wear… But what about your beloved pet? Some people have had their pets for years and consider them part of the family. Since family members are always invited to the wedding, don’t disregard Fido. There’s a role for him too. Dogs are the most common pet involved in weddings. They are used as ringbearers or are dressed up as part of the wedding party. Whatever role your dog plays, make sure your photographer takes plenty of pictures. 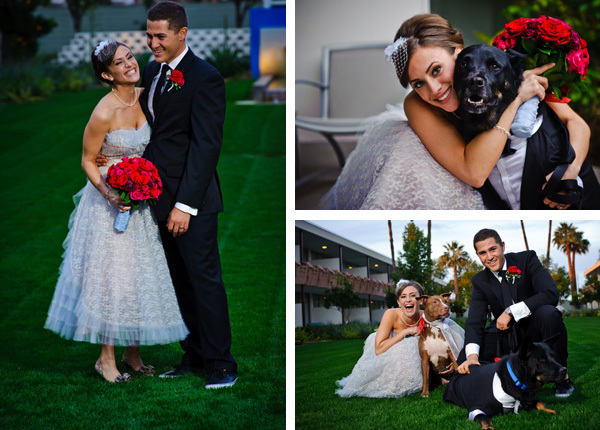 Check out these dogs that are dressed up for the ceremony and included in the posed photos. This is evidence of how much a part of the family their dogs really are. Cats are sometimes included in the wedding as well. They aren’t as easily controlled as dogs, although some cats are well-trained. If you want your cat included in your wedding album but don’t want them at the ceremony, you can have separate photos taken. Ask your photographer for some bridal portaits before the wedding and include your cat in these. This allows you to have studio photos in a controlled environment, so your cats are included but you don’t need to worry about them running off. Another option is to have your cats with you as you are getting ready for the wedding. Many couples opt for photos of the bride and groom getting ready for the ceremony. If these are done at your house, or a family member’s house, you can have your cats with you. This can get some nice, relaxed, natural photos since the cat is in its own environment. After dogs and cats, horses are the next animal that is frequently photographed in weddings. These beautiful beasts are great if a couple wants to literally ride off into the sunset. Horse lovers often have outdoor weddings with an equine or cowboy theme. Some people even get married on horseback. There are several ways you can include horses in your wedding portraits. Of course, not everyone has traditional pets. You might have a snake or hedgehog. These can all be included in your wedding photos and, depending on the pet, maybe part of your ceremony. Even if you don’t have a pet, you can have animals in your weddings. This often happens in outdoor or destination weddings when animals wander into the shot. Check out this image of a bride who is passionate about iguanas. This photo includes some beautiful parrots that were available on location but also complement the bridal ensemble. Adding animals to your wedding makes it unique and lighthearted. If your pets are dear to you, find a way to include them in your wedding photos so you can introduce them to future generations. So nice wedding photography. It's really so cute that this photo is with pets. It's really so nice.